Missouri Western’s Honors program offers high-achieving students the opportunity to enhance their college experience through interesting guest speakers, conferences across the country, a semester of study abroad, scholarship opportunities, in-depth research and study of a variety of topics, museum visits and close friendships. The Honors program has been a part of the campus community since 1988. Complete six credit hours of Honors Colloquia. Students must receive a grade of A or B in all Honors Courses in order for them to count toward General Studies Honors. The achievement of General Studies Honors appears on the student’s transcript. The student is awarded a medal the semester in which he/she is graduating to wear at the commencement ceremony. Each semester, departments across campus offer a variety of general studies honors courses designed for 10 to 20 students. One of the unique features of the Honors program is the colloquia, which are theme-based experiences involving panel discussions, presentations, guest speakers, outside readings, films and field trips. Different colloquia are offered each semester, and recent colloquia topics included Election Law and Voting Practices, Mental Side of Greatness, The Cold War, China’s History and Culture, Global Amphibian Decline, and The Puzzle of Plant Communication. Present his or her work at a regional or national conference, or a professional venue, or submit his or her work for publication in a professional journal. Students must receive a grade of A or B in all Honors Courses in order for them to count toward Majors Honors. Students wishing to pursue this option need to complete the “Majors Honors Approval Form” before the onset of the project, which is available in the Forms tab. The Majors Honors designation will appear on the student’s transcript. The student will be awarded a medal the semester in which he/she is graduating to be worn at the commencement ceremony. Rotation of General Studies Honors Courses. The General Studies Honors Program follows a two-year cycle of courses which ensures that courses from the various categories in General Studies are available at least once in every four-year cycle. General Studies Honors courses carry a section number ending with -80 or -81 with the exception of ENG112, MAT165, MAT167, and PHY210. Honors classes with labs such as BIO105, CHE111 and PED101 may have only the lecture offered as -80 or -81. In that case, Honors Students can enter into a lab without this designation. Colloquia. Different colloquia are offered each semester. In Fall, both first-semester freshman colloquia (HON195) and general colloquia (HON395) are offered. Professors from across campus apply to teach colloquia which are selected by the Honors Committee. 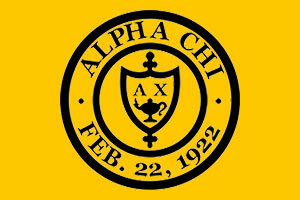 Alpha Chi is a national college honor society that admits students from all academic disciplines. Membership is limited to the top 10 percent of an institution’s juniors, seniors, and graduate students. Invitation to membership comes only through an institutional chapter. A college seeking a chapter must grant baccalaureate degrees and be regionally accredited. Some 300 chapters, located in almost every state and in Puerto Rico, induct more than 12,000 members annually. 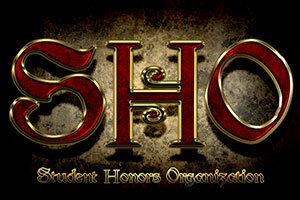 The Missouri Western Student Honors Organization (SHO) is a social club for MWSU students in the honors program that strives to unite the honors students in fellowship, excitement, and community service. SHO’s mission is to promote interest in the Student Honors Organization and MWSU Honors Program, provide fellowship among Honors students and faculty, and present the interests of Honors students to the Honors Committee. What is an Honors club? Is it a glasses-and-argyle wearing bookworm barrage that throws study parties while watching old reruns of Battlestar Galactica? Is it a gang of hipster teenagers holding car smash fundraisers and going on midnight runs to iHop? Or Taco Bell for fourthmeal? Do its members solve Rubik’s cubes, debate Dickinson, and long for Toonami’s golden age to return or go mud racing, play Halo, and turn down A Beautiful Mind for A-Team? That’s for you guys to decide. This club caters to all interests and all varieties of people – so long as they are participants in the Honors Program, of course! There is amazing potential for this club, having recently been reviewed, revamped and revved up for some fantastic activities. We are looking forward to the great time we’re going to have next semester. It’s SHOtime for Honors at Missouri Western once more!